National Cycle revolutionizes windscreen performance with the new VStream®! The advanced 'V' shape and dimensional contours push the wind vortex out and away from the riders' helmet, resulting in a peaceful, quiet environment. Greatly reduced wind noise..
Riders of the Suzuki® DL1000 and DL650 V-Strom® are sure to love the advantages offered by National Cycle's new NC-N20212 VStream® windshield. 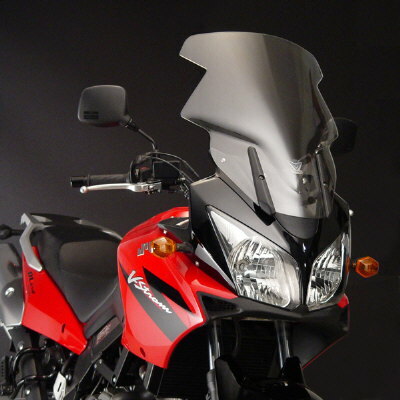 Designed specifically for the V-Strom, the N20212 VStream windshield dramatically reduces the wind noise and buffeting experienced with the stock windshield on both models, enabling longer rides in much greater comfort for riders of virtually any height. The unique 'V' shape of the VStream windshield, coupled with its 8 in. greater height and 6 in. greater width, pushes the airflow out and away from the sides of the rider's head, greatly enhancing comfort. Thick, sturdy FMR coated Lexan® polycarbonate. DOT/ABE/TUV Approved. Lexan® polycarbonate construction with FMR hardcoating also means that the NC-N20212 VStream windshield is the toughest, most scratch resistant windshield available anywhere for the DL1000 and DL650 V-Stroms. The NC-N20212 is compatible with stock handguards on DL1000 and OE accessory handguards on DL650.